Water Security in the Middle East – Source of Tension or Avenue for Peace? 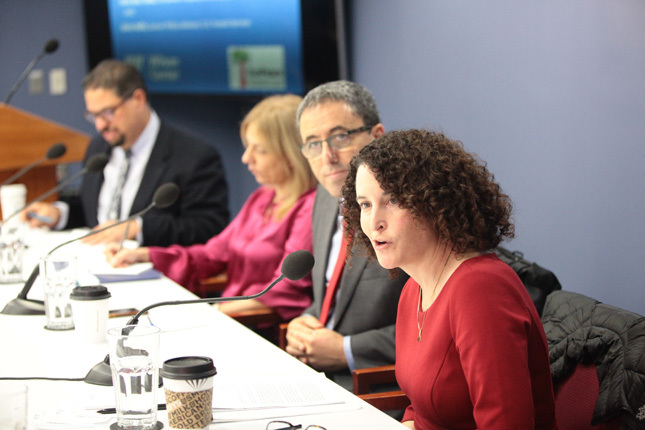 In the war-torn Jordan River Valley, we can meet the “strategic objective of reducing conflict by promoting cooperation on shared waters,” said former defense official Sherri Goodman at a recent Wilson Center event on environmental peacebuilding. Even in the midst of political disputes, Jordanians, Israelis, and Palestinians must work together to manage the scarce supplies of clean water to protect their health, their economies, and their security. This cooperation—if properly supported and leveraged—could have ripple effects for broader peace efforts. By generating political support for transboundary cooperation, pioneering and award-winning NGO EcoPeace Middle East seeks to build a lasting peace in the region. As climate change intensifies, water-related stresses could potenitally spark conflict among parties that rely on the same diminishing water resources for survival. “Droughts and other extreme events are exacerbating marginal living standards in many Asian, African, and Middle Eastern nations, where widespread political instability and failed states already are national security concerns,” said Goodman, who is currently researching the interdependent relationship between national security and water as a Wilson Center senior fellow. To catalog the factors that influence conflict over shared water resources, Oregon State University’s influential Basins at Risk project systematically evaluated transboundary water management practices around the globe. The evidence—gathered from historical records of water relations and spatial mapping technology—showed that cooperation among countries sharing international water basins occurs much more often than conflict. However, “as you move down the scale to more local levels, the findings shift,” said Shira Yoffe, who contributed to the Basins at Risk study while a graduate student at Oregon State University. “Conflict over water is more likely at smaller geographic scales, especially where there are not institutions in place to mitigate that conflict,” she said. According to Yoffe’s research, conflictive events aren’t necessarily the direct result of water stress. Instead, conflict happens when communities lack the institutional capacity to manage rapid social or physical changes, such as the construction of a large dam that changes water flows. 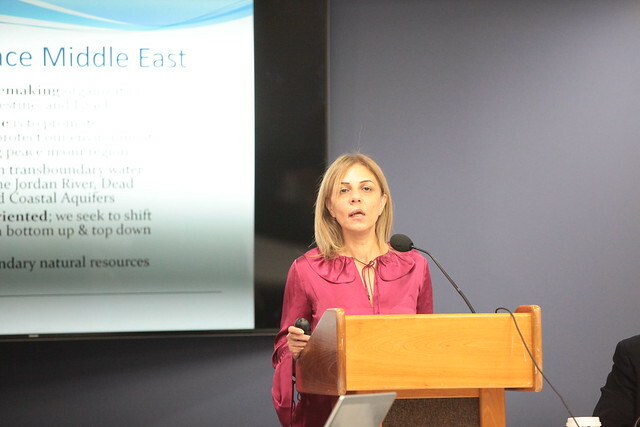 Many of the sub-state conflict incidents identified by the Basins at Risk study took place in the Jordan River Basin, which “has not historically been an easy place to work on water cooperation,” said Yoffe. The lower part of the Jordan River flows from the Sea of Galilee to the Dead Sea and forms the border between Israel, Jordan, and the Palestinian West Bank. The ecological health of the Jordan River is extraordinarily poor, as political tension has coincided with years of uneven allocation, overuse, and degradation. More than 96 percent of the Jordan’s flow has been diverted by upstream users, leaving mostly saline and sewage water behind, said Yana Abu Taleb, the Jordanian deputy director for award-winning environmental NGO EcoPeace Middle East. As a result, people in the Lower Jordan Valley are facing shortages in water and electricity, as well as a growing sanitation crisis. These crises pose significant health and security risks to Jordanians, Israelis, and Palestinians alike. And extreme declines in precipitation in an arid Middle Eastern region make the situation even worse. EcoPeace Middle East works to “build the necessary conditions for lasting peace” by generating political momentum for transboundary cooperation at all levels, said Taleb. Its Good Water Neighbors project, a groundbreaking initiative established by EcoPeace in 2001, fosters relationships among Jordanian, Israeli, and Palestinian municipalities by engaging mayors, youth, and other community members in joint projects that facilitate a shared sense of urgency around their shared water challenges. The Good Water Neighbors project has promoted consensus on the need to resolve regional water issues, encouraging Israel to supply more water to Palestinian cities, raising awareness about the negative impacts of poor water management, and strengthening institutional capacities for collaboration in the region. Leveraging the water-energy nexus and relative strengths of the different players in the Lower Jordan Valley could also lead to crucial advancements in transboundary collaboration, said Bromberg. Israel could sell more water—at an affordable price—to Jordan and Palestine, where water scarcity is greatest. At the same time, Jordan could sell more solar-generated electricity to Palestine and Israel to power the desalination plants. Those plants would then produce more water for sale back to Jordan. In this case, “we really do have winners across the board,” said Bromberg. Palestine would no longer be solely dependent on Israel for water and energy; and Jordan and Israel would benefit financially while strengthening the region’s renewable energy economy. Adopting “healthy interdependencies, we believe, is a powerful way to promote regional water and energy stability as a foundation for long-lasting peace between our people,” said Bromberg.